Alpha-Purify is delighted it is sponsoring the Infection Prevention and Control Conference (IPC) in London on the 27th February 2019. This one-day show features leading industry keynote speakers, 20 educational speaking sessions as well as exhibition space where attendees can explore the very latest science and technology advancements in the field of infection control. UV disinfection technology is playing an increasingly key role in the healthcare industry, providing safe and reliable non-chemical disinfection by disrupting the DNA of microorganisms exposed to the UV light, rendering them unable to reproduce. UV disinfection has the added benefit of being effective in deactivating organisms that have been seen to develop a resistance to traditional chemical cleaning methods. UV disinfection is effective on harmful microbes including MRSA and C Difficile. UV can be used in a variety of applications to achieve your required disinfection needs. For example, UV within HVAC units improve air quality and eliminate 99.9% of mould spores and bacteria within the unit and atmosphere, and UV disinfection cabinets are used to sterilise equipment. Mobile UV units are used to disinfect patient rooms and operating theatres alongside chemical cleaning, ensuring that every square millimetre of the surfaces in the room are treated in seconds and helping to prevent the transference of infections from one patient to the next. 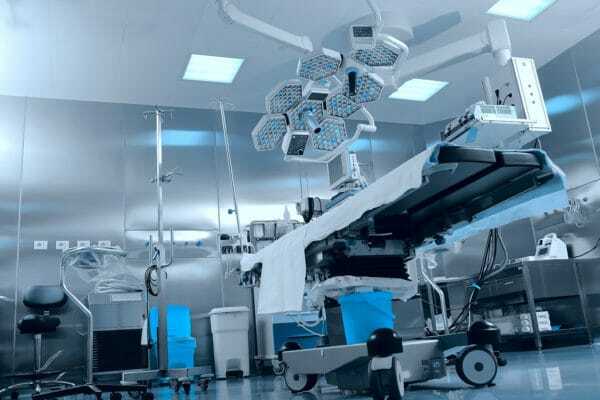 The use of UV disinfection is seen as a vital tool in the fight against nosocomial infections, ensuring patients can be safely treated in hospital without picking up further complications during their stay. Alpha-Purify offers a wide range of UV lamps and systems suitable for healthcare applications, and we can also design bespoke solutions when needed. Our dedicated research and development department is committed to delivering innovation and quality products, relied on by companies around the world for safe, effective infection. Alpha-Purify’s state-of-the-art facilities, coupled with a highly experienced team of UV engineers and production staff, ensure the highest level of customer satisfaction and support.